BetVictor are an online gambling company whom can trace their roots all the way back to 1946. They were founded by William Chandler, who was the owner of Walthamstow Stadium in London. The business eventually passed into the hands of Victor, William's father, and then Victor's own son, also called Victor, in 1974. In 2004 the company was renamed VC Bet, but reverted to Victor Chandler in 2008. In 2014 the major shareholder of Victor Chandler – Michael Tabor – took over the company and renamed it BetVictor. BetVictor have invested a great deal in improving their market position in the gambling industry since the rebranding. They've sponsored poker tournaments as well as Championship side Nottingham Forest. They also snapped up ex-England and Liverpool striker Michael Owen as a brand ambassador. New customers at BetVictor are entitled to claim a welcome bonus up to a maximum of £/€60. When you register at BetVictor, you are invited to 'opt in' to the sports book sign up bonus. You have a maximum of seven days after registering to claim your welcome bonus. To get your bonus cash, you must make your first bet at the site on a wager with odds of Evens (2.00) or greater. BetVictor will then reward this first bet with bonuses up to a maximum of £/€40. Note that if your first deposit is made via Skrill or Neteller, then you won't be eligible for the bonus. You must wager your casino bonus forty times over before you can cash out any winnings. All bonus sports bets come with the typical free sports bet caveat - when used, you do not receive back your stake with any winnings, just the winnings themselves. This welcome bonus offer is not available to residents of: Austria, Azerbaijan, Burkina Faso, Georgia, Germany, Greece, India, Iran, Japan, Kazakhstan, Kyrgyzstan, Lichtenstein, Luxembourg, Macedonia, Montenegro, Nigeria, Russia, Slovakia, Slovenia, Switzerland, Thailand and Vietnam. Promos offers do not seem to be common practice at BetVictor. When we reviewed the site, the only offers we could find were attached to the current most lucrative gambling event, which was the Cheltenham (horse racing) Festival. These deals included money back as free bets if your horse was beaten into second place in any race by a horse trained by top trainer Willie Mullins. 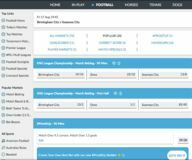 There are also the usual 'accumulator insurance' promotions, as well as offers that hope to persuade punters to use BetVictor's online casino. Find more promotions from BetVictor at our offers page. 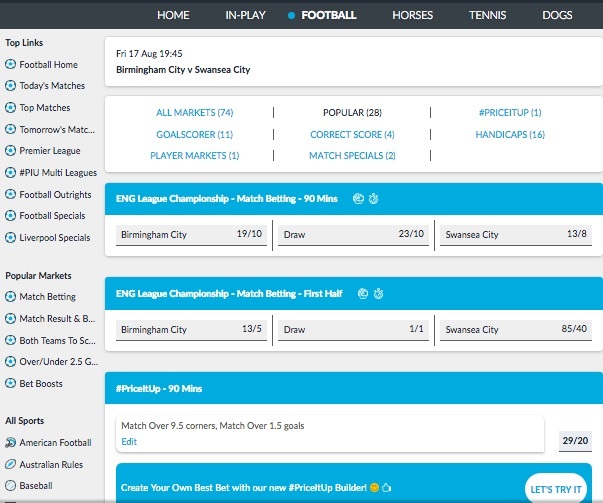 We have to say straightaway that the BetVictor site is one of the nicest-looking online betting sites we have seen. A lot of thought has been put into the design of the site and for once we find a sports betting site that finds the perfect balance between facts and figures and visual appeal. The site is subtle yet colourful and engaging. BetVictor do not go out of their way to promote their latest promotions via endlessly scrolling banner ads, although the ads for their casino site do get a little annoying. All the big race meetings and football matches are always given priority billing, but if you want to bet on more eclectic events, then you should not have a problem. All major and minor worldwide sporting events are covered, and finding countless sports betting markets is never more than a click or two away. The payment methods at BetVictor are as you'd expect: Visa, MasterCard, PayPal, Neteller, Skrill, Entropay, Diners Club, Paysafecard (which now includes Ukash), Bacs and bank transfers. The minimum you can deposit is £5. There are no maximums. The minimum you can withdraw is £10. There are no fees involved. Nearly all deposit methods are transacted instantaneously. When it comes to withdrawals, eWallets are usually processed within one or two days. Credit and debit cards take slightly longer – three to five days. BetVictor really does hit the nail on the head when it comes to online sports betting. Appearance-wise, we can't think of many other sites that look as nice at BetVictor's site. Our only wish would be a few more promotions, but then seldom do you get everything that you ask for.